We tackle these problems by developing statistical and computational methods and applying them to large-scale genomic data. This process combines biological aspects in the early stages (e.g. problem statement, identifying relevant empirical observations, determining dependable benchmarks and controls), statistical, algorithmic, and computational aspects in the middle (e.g. model formulation, programming, scaling up), and biological aspects again at the end in the interpretation of the results. Orthologs are genes in different organisms that descended from the same ancestral gene in their last common ancestor. Accurate and comprehensive identification of these "same genes in different species" is a prerequisite for numerous biological studies, medical research and pharmaceutical applications. 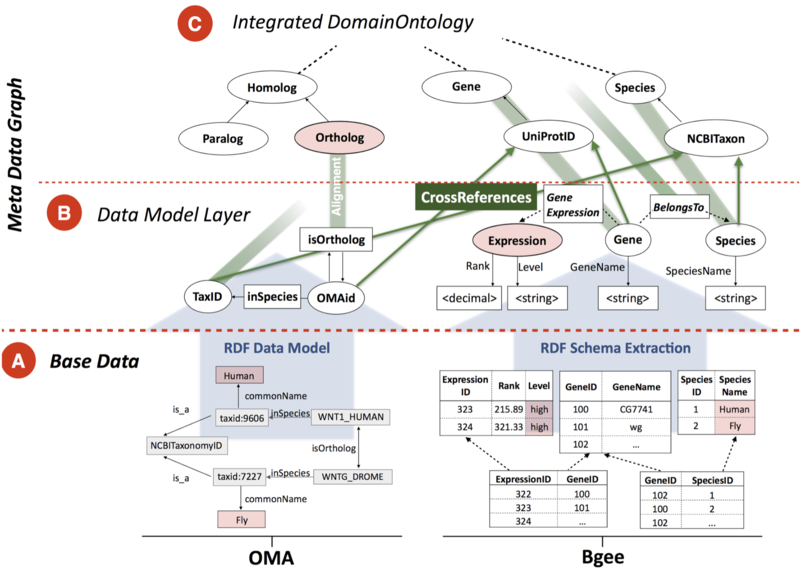 Our main activities in this space are around OMA (Orthologous MAtrix), an effort to identify orthologous genes among publicly available genomes. 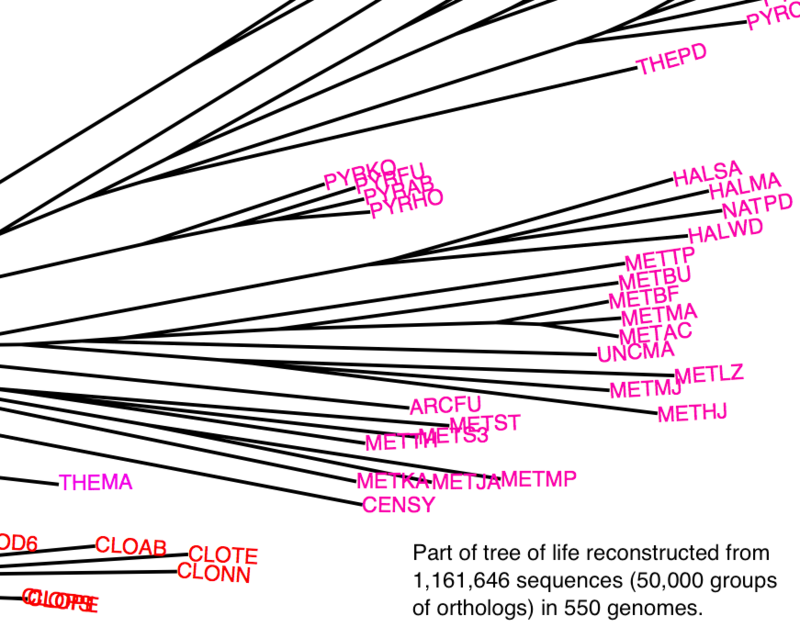 With currently over 2100 genomes analysed, OMA is among the largest databases of orthologs. Its web interface is consulted hundreds of times every day, and is linked from several leading sequence databases, including UniProtKB, WormBase, and HGNC. We are also interested in applications of orthology. For instance, to better characterise the relationship between gene sequence evolution and gene function, we tested the validity of the "ortholog conjecture", the notion that orthologs tend to be functionally more conserved than paralogs. The story behind this work was written in a guest post on Jonathan Eisen's blog. Typical comparative genomics analyses consider either single-copy genes across multiple species, or multi-copy genes between pairs of species. Multi-copy genes across multi-species remains hard. Yet genomes are replete with multi-copy genes. To overcome this, we have embraced the concept of Hierarchical Orthologous Groups (HOGs). A HOG comprises all the genes that have descended from a single gene across a clade of interest. Hence, HOGs relate present-day genes in terms of their common ancestral genes in key ancestral species. For instance, all mammalian insulin genes descended from a single ancestral insulin gene at the root of the mammals; they are thus in one mammalian HOG. But within rodents, where insulin has duplicated, the two insulin copies in mouse or rat are placed in distinct rodent HOGs. The shift from pairwise orthology to HOGs requires new approaches for inference, benchmarking, visualisation, and integration to downstream analyses. We are at the forefront of this shift, with several ongoing projects, e.g. HOG inference and visualisation in the OMA database (funded by a SIB resource grant), mapping of functional shift onto HOGs (funded by a UK BBSRC grant), or inference of HOGs in polyploid crop species (research agreement with BASF CropScience). Looking forward, we foresee HOGs forming the backbone of any cross-species comparison—e.g. comparing the evolution of gene splicing across species, of gene expression, of gene regulation, or indeed of any aspect of gene function. With the growing importance of non-model species—facilitated by tools such as CRISPR/Cas9 and sequencing-based assays—multi-species analyses will further grow in importance. Much of today’s computational biology entails a “Big Data” approach: extracting knowledge from voluminous and heterogeneous data. This offers new challenges and opportunities. For instance, when we have more data than we can process, the scalability of our methods becomes more important than their statistical efficiency. A challenge with very large datasets is that they tempt us to devise ever more complex models, which however do not necessarily result into better predictions or biological insights (e.g. due to the “curse of dimensionality” or overfitting). Thus we seek to not only utilise big data when appropriate, but also to better understand their pitfalls and how of overcome these. Bio-SODA: Enabling Complex, Semantic Queries to Bioinformatics Databases through Intuitive Searching over Data (National Research Program 75 Big Data grant with ZHAW and SIB). The goal of this project is to make it easy for biologists to ask questions integrating knowledge across multiple databases, such as “What are human-fly orthologs which are expressed in blood and are associated with leukemia?”. We need to solve three problems: what are the biological entities shared between databases (ontologies), how to query databases in a decentralised manner, and how to make the system usable by a biologist without specialised training. Adaptive approach to sequence clustering (National Research Program 75 Big Data). 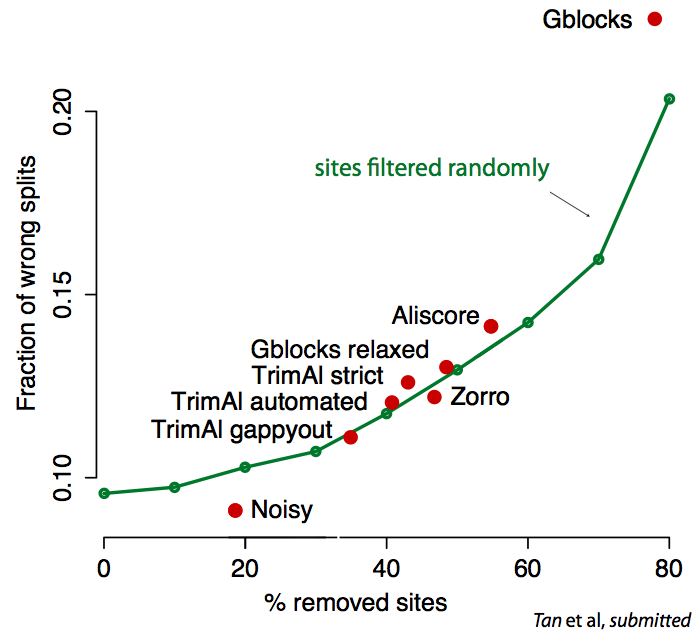 Current methods for sequence homology search are either sensitive but slow (all-versus-all alignments), or fast but insensitive (using k-mer or other approximations, but requiring >80% sequence identity). We aim to searching homologs using an adaptive, two-layered clustering approach, which is very fast for close variants of known protein sequences but still sensitive for distant counterparts. This will make it possible to process the huge datasets produced by metagenomics analyses (which are orders of magnitude larger than UniProt). Since Darwin, reconstructing the tree of life has been a major pursuit of biology. High-throughput genome sequencing is providing us with an abundance of molecular data, but we still struggle to resolve the deep phylogenies. Under current methods, adding more characters does not always improve phylogenetic resolution; and indeed, typical tree reconstruction efforts only involves a tiny fraction of all genes. In this project, we develop a phylogenetic tree building method that is sufficiently efficient to take into account most genes of each species, and that can handle a mixture of evolutionary histories. Using the majority of genes from a thousand genomes, we seek to infer the number of different trees that best capture the evolutionary history of species, to reconstruct these histories, and to visualise them in an insightful way. Sequence alignment and phylogenetic tree reconstruction methods are among the most important contributions of bioinformatics to the life sciences. 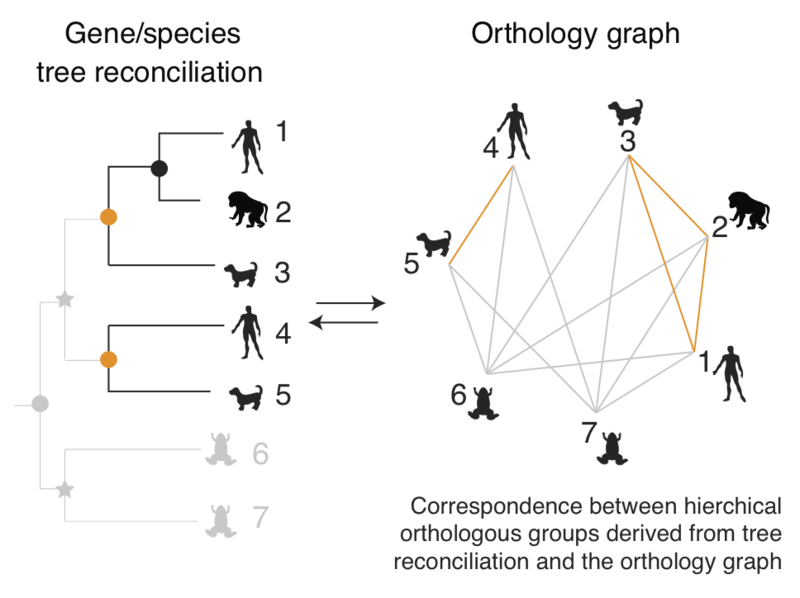 Both methods infer past events from current data, be it common ancestry among characters for alignments, or evolutionary relations among sequences for tree builders. Because of the inherently unknown nature of these past events, validation/comparison of the methods (and of their underlying models) is notoriously difficult. Real data validation is often limited to anecdotal evidence. In better cases, it consists in some goodness of fit measure (e.g. AIC). Even then, these measures are based on (implicit) assumptions, which themselves would need to be tested. Recently, we have introduced real data tests for orthology inference and for sequence alignment. Our tests solve the validation problem indirectly—by assessing the compatibility of a method’s results with general, well-accepted principles or models. Methods that produce more compatible results are to be preferred. For instance, the "minimum duplication test" ranks alignment methods by assuming only that genes evolve along trees, and that the principle of parsimony applies to gene duplication events. 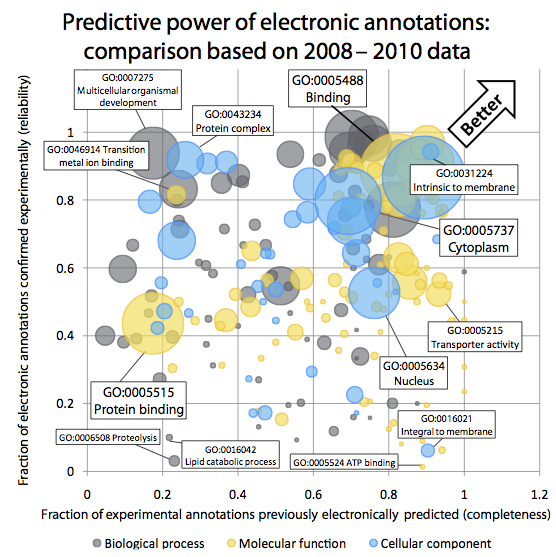 How can we systematically and quantitatively assess the reliability of electronic GO annotations? Which current inference strategy yields the best predictions? In particular, how do evolutionary-based strategies compare with profile-based strategies? We have written the story behind some of this work in a blog post. Last modified on February 19th, 2019.